On November 15th my husband Bill and I endured what every pet owner dreads, the loss of a beloved companion. 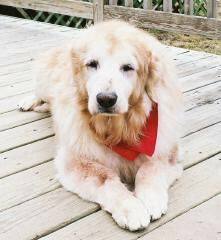 Molly came to us through Long Island Golden Retriever Rescue as a senior citizen, 3-1/2 years ago, at the age of 12. She was found by a good Samaritan as she wandered the Islip R/R tracks, alone. Molly was suffering a multitude of health issues including sever pneumonia. She had apparently been homeless for quite some time. It was a miracle she survived the winter. Bill and I have a penchant for fostering and adopting seniors and realize we will not have many years to enjoy with them. Unfortunately, this fact does not make saying good-bye, easier. Molly was a regal lady. She was intelligent, loving and the epitome of what a golden retriever is perceived to be. Molly greeted all who crossed her path with gracious acceptance, whether it was a fellow canine, a frisky cat or a loving, out reached hand. She became a Canine Good Citizen and attended many events during the past 3 years. Her kind and gentle personality earned her the title "The Duchess Of Terry." When attending rescue events, children and adults alike, gathered to meet her. Knowing her was a privilege, loving her, an honor. Her house mates are confused and we are heartbroken over the loss of a very significant member of the "pack." Nothing will ever be the same, again. We will miss Molly and she will be forever be in our hearts. Here&apos;s to you old girl, may you reign with love and respect over your new kingdom, "The Rainbow Bridge."